SunOpta subsidiary Sunrise Growers is recalling frozen organic dark sweet pitted cherries that may be contaminated with Listeria monocytogenes. No illnesses related to the consumption of the product have been reported. 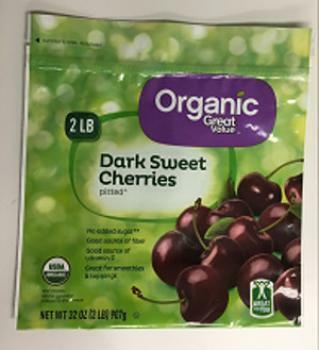 Ninety cases of Great Value Organic Dark Sweet Pitted Cherry products distributed from Sunrise Grower’s facility in Edwardsville, Kansas on August 10, 2017, are being recalled. The product is packaged in 32-oz. printed plastic zip top bags and marked with a Best By Date of 08/10/19 on the back, with the UPC code 078742126166 and the lot code FED722211 or FED722212. These recalled product was distributed to a customer distribution center in Louisiana and may have been redistributed to stores in Louisiana and Mississippi. Customers who purchased the recalled product should not consume it, but return it to the store where purchased for a refund, or simply discard it. Consumers with questions may email the firm at contactus@sunopta.com or call 1-800-854-1988 Monday through Friday, 8:00 a.m. to 5:00 p.m. (PT).